Place patties on parchment lined sheet pan and heat in 350° F oven for 15-20 minutes. Remove from oven and place 1 oz. cheese on each patty. Return to oven for 5 minutes until cheese is melted and the patty reaches 165° F as measured by a meat thermometer. Lay out buns. Place one patty on each bun. Portion a #20 scoop of guacamole on patty. Place 2 slices of tomato and 1 slice of red onion on top. Add top of bun. Serve one burger as one portion. WEIGHT: 17 lb. 4 oz. Whole grain ciabatta bun, 2 oz. or Whole grain hamburger bun, 4", 2 oz. 1 serving provides 3 oz. meat/meat alternate, 2 oz. Eq. servings bread/grain, and ¼ c. (Other) vegetable. 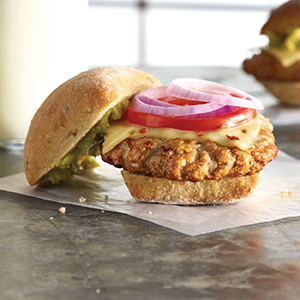 JENNIE-O® Savory All Natural Turkey Burger Fully Cooked, #616630 50 ea. 8 lb. 10 oz. 100 ea. 17 lb. 4 oz. Monterey Jack or pepper jack cheese, sliced 3 lb. 2 oz. 6 lb. 4 oz. Whole grain ciabatta bun, 2 oz. or Whole grain hamburger bun, 4", 2 oz. 50 ea. 100 ea. Guacamole, prepared 2 qt. 2 c. 1 gal. 1 qt. Tomato, sliced 1/8" 3 lb. 6 lb. Red onion, sliced 1/8" 1 lb. 9 oz. 3 lb. 8 oz.